What is OWASP ZSC ? 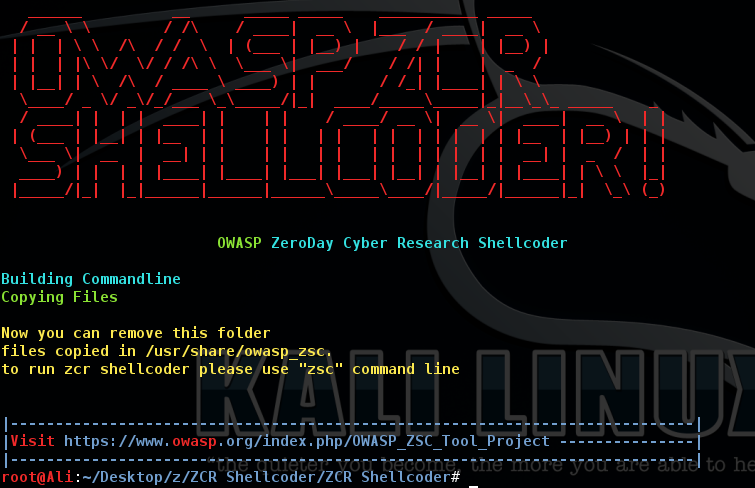 OWASP ZSC is an open source software in Python language which lets you generate customized shellcodes and convert scripts to an obfuscated script. This software can be run on Windows/Linux/OSX under Python. Shellcodes are small codes in Assembly language which could be used as the payload in software exploitation. Other usages are in malwares, bypassing antiviruses, obfuscated codes and etc. This tool is related to IT, Hacking, Programming and Computer|Network|Software Security. The word “Hack”, "Pen testing",“Hacking” that is used on these project pages shall be regarded as “Ethical Hack” or “Ethical Hacking” respectively. This is not a tool that provides any illegal information.We do not promote hacking or software cracking. All the information provided on these pages is for educational purposes only. The authors of this tool are not responsible for any misuse of the information.You shall not misuse the information to gain unauthorized access and/or write malicious programs.This information shall only be used to expand knowledge and not for causing malicious or damaging attacks.You may try all of these techniques on your own computer at your own risk.Performing any hack attempts/tests without written permission from the owner of the computer system is illegal. IN NO EVENT SHALL THE CREATORS, OWNER, OR CONTRIBUTORS BE LIABLE FOR ANY DIRECT, INDIRECT, INCIDENTAL, SPECIAL, EXEMPLARY, OR CONSEQUENTIAL DAMAGES (INCLUDING, BUT NOT LIMITED TO, PROCUREMENT OF SUBSTITUTE GOODS OR SERVICES; LOSS OF USE, DATA, OR PROFITS; OR BUSINESS INTERRUPTION) HOWEVER CAUSED AND ON ANY THEORY OF LIABILITY, WHETHER IN CONTRACT, STRICT LIABILITY, OR TORT (INCLUDING NEGLIGENCE OR OTHERWISE) ARISING IN ANY WAY OUT OF THE USE OF THIS SOFTWARE, EVEN IF ADVISED OF THE POSSIBILITY OF SUCH DAMAGE. Why use OWASP ZSC ? Another good reason for obfuscating files or generating shellcode with ZSC is that it can be used during your pen-testing. Malicious hackers use these techniques to bypass anti-virus and load malicious files in systems they have hacked using customized shellcode generators. Anti-virus work with signatures in order to identify harmful files. When using very well known encoders such as msfvenom, files generated by this program might be already flagged by Anti-virus programs. Our purpose is not to provide a way to bypass anti-virus with malicious intentions, instead, we want to provide pen-testers a way to challenge the security provided by Anti-virus programs and Intrusion Detection systems during a pen test.In this way, they can verify the security just as a black-hat will do. According to other shellcode generators same as Metasploit tools and etc, OWASP ZSC using new encodes and methods which antiviruses won't detect. OWASP ZSC encoders are able to generate shell codes with random encodes and that allows you to generate thousands of new dynamic shellcodes with the same job in just a second, that means, you will not get the same code if you use random encodes with same commands, And that make OWASP ZSC one of the best! During the Google Summer of Code we are working on to generate Windows Shellcode and new obfuscation methods. We are working on the next version that will allow you to generate OSX. The OWASP Security Principles are free to use. In fact it is encouraged!!! Additionally, I also encourage you to contribute back to the project. I have no monopoly on this knowledge; however, we all have pieces of this knowledge from our experience. Let's begin by putting our individual pieces together to make something great. Great things happen when people work together. The OWASP Security Principles are licensed under the http://creativecommons.org/licenses/by-sa/3.0/ Creative Commons Attribution-ShareAlike 3.0 license], so you can copy, distribute and transmit the work, and you can adapt it, and use it commercially, but all provided that you attribute the work and if you alter, transform, or build upon this work, you may distribute the resulting work only under the same or similar license to this one. With using OWASP ZSC you would be able to generate any customized Shellcode in your mind including encodes and Disassembly code in few seconds. OWASP ZSC Version 1.0.9.1 Released! To see full guides please visit our wiki page. Shellcodes are small codes in Assembly Languagewhich could be used as the payload in software exploiting. Other usages are in malwares, bypassing anti viruses, obfuscated codes and etc. According to other shellcode generators such as Metasploit tools and etc, OWASP ZSC using new encodes and methods which antiviruses won't detect. OWASP ZSC encoders are able to generate shell codes with random encodes that allows you to generate thousands of new dynamic shell codes with the same job in just a second, it means you will not get the same code if you use random encodes with the same commands, and that makes OWASP ZSC one of the best! OWASP ZSC can generate shellcode for Linux and Windows _x86 Upcoming features will allow generating shellcodes for OSX And new encodes for the code obfuscation. To run OWASP ZSC, You need to install python `2.x|3.x` on your operation system `Windows|Linux|OSX`, Then it could be run directly with executing `zsc.py` or run the software after you installed it! To see the user manuals, Please follow the next steps! Via `zsc` command, you are able to enter the software [or run python zsc.py if you don’t want to install it], Then you can have a list of menu with entering `help`. You can have your choices with pressing `tab` key on each step. To generate shellcode, you have to type `shellcode` and then press enter, after that, you can see what’s available in `shellcode` section. There is `generate` , `search` and `download` choices in here which use for `generate shellcodes`, `search` and `download` shellcode from shellstorm. To generate a shellcode, type `generate` and press enter, after that with a `tab` key, you can have list of operation systems available in there. With pressing `tab` key again, functions will be shown for you in this step [ such as `exec` ,`systm`,`write` and `etc`]. choose your function by writing the name `example: exec` and press inter. In the next section you have to fill the argv of function which exec() function have one `example: exec("/bin/bash")`, all you need in this section is pressing a `tab` and then `enter` key, software will automatically ask you for function argv. Fill them and next section software will ask you for shellcode type which can be `none` or choose one of listed encoding types. After entering that, your shellcode is ready! There is one more way to have a shellcode from software, which is using shellstorm API. Following the `shellcode`, and then `search` commands to search for a shellcode. After that shellcodes will be listed for you with title name , ID and etc. you can download them with following `shellcode` and then `download` command to download them with the ID which shown to you in the past section! For canceling each section, you can use `restart` command to restart the software and start new task! With the following `obfuscate` command, you can begin the step for obfuscating a code. With a `tab` key , you can see the list of languages along with the obfuscating module ready. After choosing the language software will ask you for a filename which is a filename of file you want to obfuscate that! Next step software will ask you for encode type. With a `tab` key list the encode modules and choose your encode name. your file rewrited and converted to a obfuscate with encode type you chosen. And do not worry about your original code, it’s saved in file as a comment! Note: Software installation directory is "/usr/share/owasp-zsc"
Note: OWASP ZSC Tool could be execute on Linux and Python 2.7.x is required. OWASP ZSC could be improving with handling module features. MVP of this project is build and active the first module which could be usable to generate/encode Shellcode which already some of them [modules] activated. Highest usage of OWASP ZSC Tool could be when users are able to use all features with best User Interface and API performance. Developers can add new features and if you don’t have an idea but like to develop, you can submit the issue, which software needs to be fix/add/done in HERE. After fix/add or develop something, please send your pull request and remember that your code must be compatible with python2 and python3. If you have any question you can open an issue or just mail us. do not forget to register on our mailing list. Purpose: OWASP ZSC is an open source software in python language which lets you generate customized shellcodes for listed operation systems. This software could be run on Linux under python 2.7.x. This page was last modified on 14 August 2018, at 14:24.